Histones are proteins that bind the DNA in eukaryotic chromosomes forming structural units called nucleosomes. The DNA double helix is wrapped around histones, the nucleosomes are in turn packaged together to form chromatin. Chromatin is an easily stainable mass that is visible under a standard optical microscope during cell division. 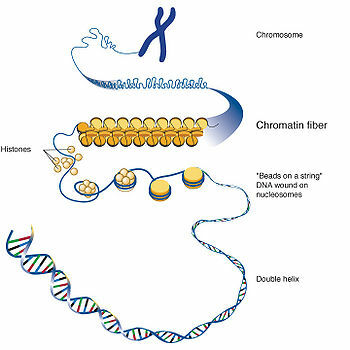 The chromatin includes the chromosome, which are bound by histone and non-histone proteins. (Alberts, et al., 219). The overall Chromatin structure in mammals can be inherited and since it does not require the direct modification of DNA, it is a form of epigenetic inheritance. Heterochromatin, which is a highly condensed form of chromatin, can turn off any genes that are packaged this way. This type of chromatin can be especially effective as an epigenetic mechanism, because the DNA is harder to access in order to be transcribed. In the opposite type of chromatin configuration, euchromatin, there is an open chromatin configuration and the genes are more readily accessible. Not surprisingly, scientists have found that genes are usually silenced in heterochromatin and active in euchromatin (Misteli, 790). However, there is not always an exact correlation between these effects and it needs to be studied more to be understood fully. The addition of specific histone variants (unique histone proteins that are not normally incorporated) into chromatin can also lead to an inherited form of information. Study has revealed that combinations of different histone variants can impact when and how the packaged DNA is accessed (Alberts, et al., 225). This very complicated “histone code” is implicated in regulating gene expression and has roles in DNA repair. Histones may also be modified, just like DNA is methylated, by acetylation, methylation, phosphorylation, ubuitination, sumoylation, ADP ribosylation and proline isomerization, but these methods of histone modification have not all shown a clear epigenetic effect like DNA methylation (Shi, 640). Other studies have shown links between these types of histone modifications and DNA methylation, so it may be a case of all of these mechanisms working together to form a type of epigenetic inheritance . Research interests by Keith D. Robertson. University of Florida. Alberts, Bruce, Alexander Johnson, Julian Lewis, Martin Raff, Keith Roberts, and Peter Walter. Molecular biology of the cell. New York: Garland Science, 2008. Print. Misteli, Tom. “Beyond the sequence: Cellular organization of genome function.” Cell 128 (2007): 787-800. Web. Mar 8 2010. Shi, Yang. “Taking Epigenetics Center Stage.” Cell 128 (2007): 639-640. Web. Mar 5 2010. This page was last modified on 2 November 2013, at 18:34.